CM323 is a 3 Way HDMI 2.0 4K switch for your latest gaming or home theatre setup. 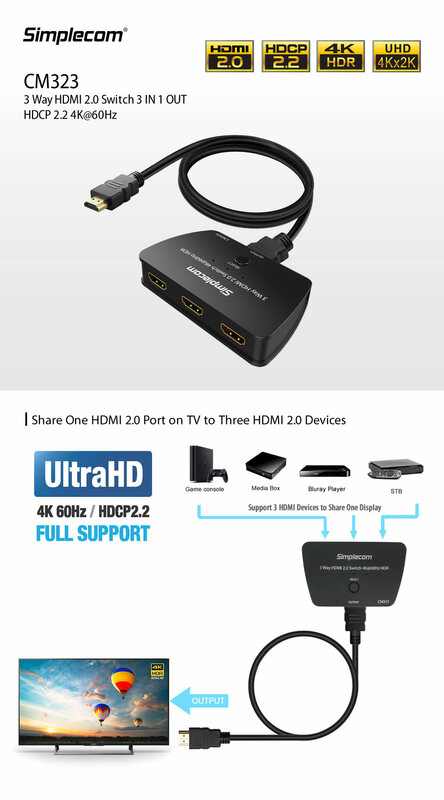 It widely compatible with most HDMI devices and supports HDMI 2.0 and HDCP 2.2, ideal for latest online streaming box and game console with 4K UHD HDMI output. This HDMI 2.0 4K switch is also backward compatible with previous HDMI revisions with 1080p / 720p video resolution devices. Easy plug & play operation simply plug in the HDMI input sources into the input connections and the output connection to your TV or projector. It will automatically switch to the currently active input source if there is only one active input. If there are multiple active inputs, you can select the input by press the select button on the switch. *Note: Apple TV and some online streaming box keeps its HDMI port active even in the sleep state. Hence, auto-switching may not work with them. Manual switching can still be used in this scenario.